Today I’m going to outline two approaches to raising money while setting up an indie dev studio. Grants and Game Shows. Firstly – applying for grants. There are many grants out there and all have different criteria and terms. Some need you to raise matched funding – which means they’ll give you an amount of money if you can match it with the same amount of your own. This is not too helpful when you are starting out and your games and other products are not making tons of money yet. So, we just applied for a £25,000 grant from the UK Games Fund. The money, if we were to get it, can only be used to pay wages for UK-based staff and contractors on one particular project, which you had to pitch to them. The first stage involved filling in a form with our details and something about our top secret new game – and also uploading a video pitch about our team and the game. The form was fairly simple and only allowed 100 words for the game pitch. However the video had to be 2 minutes long and tell them about the team, what we can do, what we’ve done before (they like it if you can show that you’ve actually finished a game and brought it to market) and some footage of the prototype of your new game idea. You had to finish off with your plans for the future. So, the form was due in at noon on November 23rd – and we actually made the deadline! We were then invited to upload our video pitch – so now we have to wait until January to hear if we’ve made it to the second round. Meanwhile, we had another plan to raise money – why not go and win some money on a TV game show? 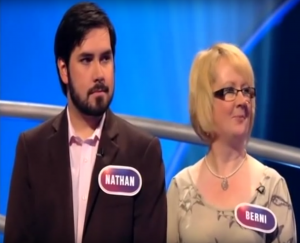 Well, we have been on Pointless a few years ago (although we did get knocked out in the second round on both our shows!) so maybe it was worth a go. We both liked The Code when that was on a few months ago and we had noticed that they were asking for contestants for the new series. 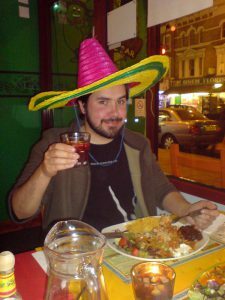 I filled in the form yesterday and attached a photo of Nathan in a sombrero and sent it off via the web. Within half an hour we had a TV researcher on the phone asking if we were free to answer some general knowledge questions over the phone. There would be 10 questions – but she wouldn’t tell us which we’d got correct. We agreed, so I had to take my phone into another room, while she asked me the questions, then leave Nathan alone in the office while he did them too. There was a variety of topics including history, geography, celebrities, maths and poker! I’d better not tell you them all – in case they are still using them, but I knew the celebrity question and Nathan didn’t. Not sure what that says about us! Anyway, as soon as Nathan finished his questions, she asked us to come to Birmingham for an audition on Tuesday! So, wish us luck! If we get through that, which involves written general knowledge test and a run through of the actual game format, then the TV programme is filmed in January. So, next year could be quite interesting! 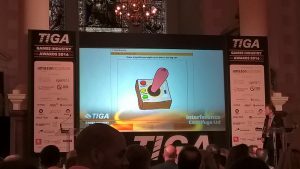 Last week we enjoyed another jaunt down to London – this time to attend the very swish TIGA Awards at Christ Church in Spitalfields. We went because our first game, Interference, was shortlisted for two awards – Most Original Game and Best Casual/Social Game – so we had to dress up! 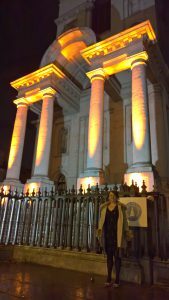 We managed to find some where to stay (as it was going to be a late night!) just down the road from the venue. It was Commercial House – a kind of aparthotel – which was lovely! 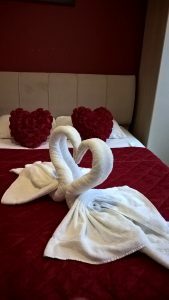 We especially liked the swans 🙂 It was easy to get dolled up and then walk the 3 minutes down the road to the venue. 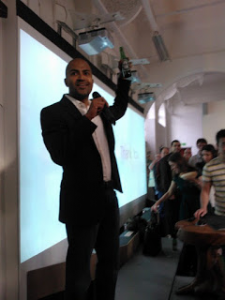 The ceremo ny started at 6pm with a drinks and canapés reception. There was plenty of champagne and the smart staff circled guests with trays of tasty treats – the tiny ham and eggs were delicious, as was the smoked salmon. When we got there we were assigned Table L, so we hung around there waiting to see who we would be sitting with. We got chatting to Gareth Wright from Double Eleven – the UK studio who reimagined Prison Architect for the Xbox and PS4 as well as making Goat Simulator for the Xbox last year! Then we had to take out places at our tables so that the food could be served. We were sat with a couple of chaps from a technology tax company MMP – who were up for an award and staff from Spirit AI who make digital interactions between game characters and players “feel human”. They were handing out one of the awards. There were bottles of beer, water and wine on the table and the first course was fillet of beef with baby baked potatoes and salad. It was very nice, although the chap sat next to me said “I thought that was a starter!” The dessert was delicious though – an individual lemon meringue pie. It was perfectly baked – no soggy bottom here and the top was beautifully browned and crisp. Yummy! Then the nerve-wracking part began – the giving out of the awards. Well, to tell the truth we weren’t too worried – we knew we weren’t going to win over all the big companies in our categories. So many of the teams who went up on stage were huge – and we are just two people who make games in a home office! The winner of most Original Game was The Assembly – a virtual reality game from nDreams and the Best Casual/Social Game was a motorbike racing game, Raceline CC by Rebellion. They both looked very impressive – congratulations to them. There were so many amazing games shown that we felt privileged to be sitting there with them! In fact Nathan’s Imposter Syndrome was kicking in bigtime! He’s going to write a post about that very soon – so look out for that one. Still it was fun to see Interference up on the huge TIGA screen when they showed our video! After all the awards had been handed out and all the booze on the tables drunk – the party continued below in the Crypt. It was an amazing space, where a bar was up and running and there were sticks of TIGA rock liberally spread around. 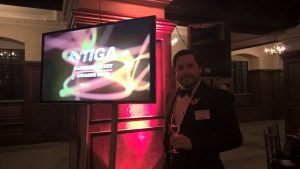 We had a chat with a few of the winners and the TIGA staff as well as reconnecting with Gareth and others. 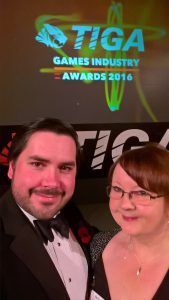 It was a really good night and we were so happy to have been TIGA Finalists in our first year! Microsoft are a huge global company and are always hooking up with other big organisations to improve life through technology in so many areas. But, Microsoft also look after the little guys who just make games too – which is why we love them! Ever since we started making Interference – our first ever game – they have given us so much help and encouragement along the way. Even though we are just two people making games as a hobby they couldn’t have been more encouraging and helpful. We got to know some of the evangelists and they would often call up and ask how things were going. 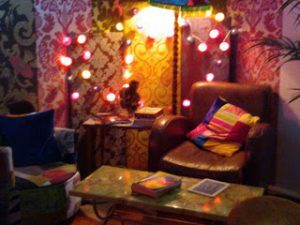 Back in 2012 when they were launching Windows 8 they set up a fantastic place in London for 18 months called Modern Jago – where developers, designers and artists could work and meet for free in a disused school in Shoreditch. 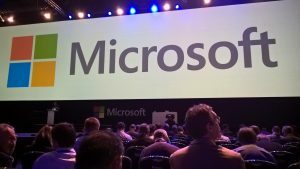 Sadly for us we couldn’t make use of it frequently as we live in Staffordshire – but Microsoft invited us to many free events there over the months. We attended the Windows 8 Launch there, the Critter Awards and also the Future Publishing’s App Generator Awards where our game was one of the 10 winners. We were given lots of equipment (laptop, tablet, phone) which really helped with our app development at the time. 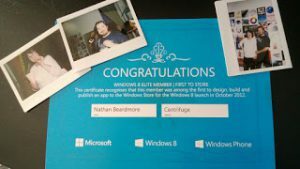 We were very proud of being selected at the Windows Elite who were first to store with a Windows 8 app. They certainly know how to put on a party too! There was always free food and drinks and unusual entertainment such as Mixology lessons, Oxygen bars and Make your own T-Shirt Sessions. They were also responsible for introducing us to the awesome Rayguns Look Real Enough band and the tiger onesie! 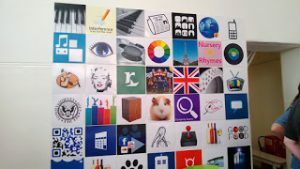 Wall of Fame – Interference 2nd in on top row! Since then we have both quit our jobs to become full-time developers and have been accepted on the BizSpark programme which gives us so much more help for our indie games studio. We gain Visual Studio Enterprise with MSDN Subscription, $150/month of Azure Credits, Office 365 Developer, and Windows Store membership. We also get the ability to sign up for 4 Technical Support Incidents for our start-up. This is saving us a fortune in storage costs each month as Interference – being a drawing game needs a lot of space! 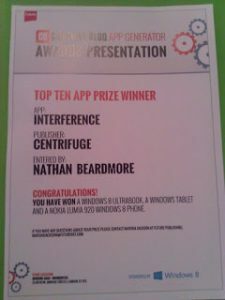 So, the first thing we did was to relaunch the web version of Interference – optimised to work on all devices. Then came the UWP (Universal Windows Platform) Windows 10 App – even though we are constantly being asked for an iOS and Android app by our players. So, our shiny new Interference Windows 10 App is now in the Windows store and the wok begins on the other versions…wish us luck! PS Before that we are launching our brand new word game (on Windows first!) called Loose Vowels. Look out for announcements soon! 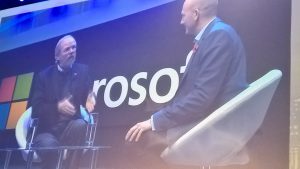 We had a nice break this week and headed off to London for the Microsoft event – Future Decoded. It’s a yearly event that started three years ago and we’ve managed to attend all of them so far. We were still very happy to be there though, as we could catch up with our fellow local company Risual from down the road in Stafford. They are sponsors of the event and their latest corporate video is always one of the highlights of the day for many people. All of them are very funny – and I remember well the reception their very first one got from the packed auditorium of thousands of geeks – mainly along the lines of “What on earth…?? ?” Have a look here http://www.risual.com/about-us/ to see it. This year’s production was very swish featuring cardboard versions of Richard and Alan – the company’s founders. On their stand in the expo you could see the actual models (and the real-life ones). They were handing out bottles of Risual water and at the end of the day – RisuALE – actually brewed by our friends Brad and Viv at Lymestone brewery! Anyway – back to the point of Future Decoded! The morning was taken up with keynote speeches from a fascinating array of speakers from different backgrounds. I think the most eye-opening one was from Dr Ian Levy, Technical Director of the National Cyber Security Centre. I’d never thought about it before, but when he talked about how users of technology are told to change their passwords frequently or make long and complex passwords for every different application they use means that they are being blamed for the weaknesses in the system! What should happen is that the systems should be properly protected in the first place! We as developers have a responsibility to make our applications as safe as possible. it was good to hear about the new National Cyber Security Centre – part of GCHQ. Dr. Levy promised that they would be as open and transparent as possible about the cyber threats they deal with – how they work and where they come from, so that the public is aware of the growing threat from cyber crime. 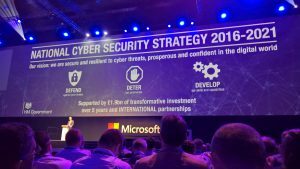 Following on from that, at the end of the morning session we heard from the Chancellor of the Exchequer, Phillip Hammond who launched the UK’s new National Cyber Security Strategy. It was quite scary to hear about the possibility of another “rogue state” as he called it, could try to air traffic control, power supplies and other vital services to leave us powerless. He said that we would track down the people responsible and retaliate “in kind” to any such attempts. On a lighter note we were earlier treated to a demo of live translation of Skype calls. They started with two phones simultaneously translating between French and English conversation. That was then joined by Chinese, German and finally Klingon. Very impressive! It’s not quite ready for launch yet – but will be a game-changer when it goes live! There was a long lunch break – so we took the chance to visit the other Fox pub – at the other end of the Excel Centre – the Fox@Excel They seemed a little unprepared for a sudden influx of hungry geeks – but we enjoyed a very nice chicken chorizo and avocado granary sandwich before returning to the Expo part of the event. The afternoon keynotes were also brilliant. We heard from Martine Wright, an amazing woman who lost both legs in the 7/7 terrorist attacks on the London underground. She didn’t let it ruin her life or sit around feeling sorry for herself instead she skydived, learned to ﬂy, and become a member of the British 2012 Paralympic volleyball team. It was an inspiring story from someone who had been through so much and yet rebuilt a new life and is having a ball! She even says that 7 is now her lucky number! Makes our petty problems pale into insignificance. The final speaker of the day was world famous author Bill Bryson! Having recently become an author myself (see the CUP Diaries on Amazon!) this was an added bonus for me! He was funny and insightful and he certainly raised applause and rueful laughter when he said his biggest problem with technology was everytime he switches on his laptop he has to wait for an hour while all the updates get installed. Interviewer Ryan Asdourian, Windows & Devices Business Group Lead at Microsoft. Before we left we attended the free drinks reception with beer, wine and the aforementioned Risuale. 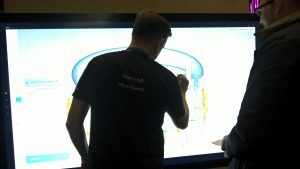 We stayed to see if we’d won one of the many Surface products they were giving away on the day – but sadly we had not. Then it was onto the DLR and back to Euston for the slow train back to Stoke.